To Cite: Ebrahimzadeh M H, Moradi A, Sayyed Hosseinian S H, Khalesi M K, Hejrati Kalati H. Chronic Distal Femoral Osteomyelitis Following Arthroscopic ACL Reconstruction: A Case Report, Trauma Mon. 2017 ; 22(4):e28412. doi: 10.5812/traumamon.28412. Introduction: Osteomyelitis following ACL reconstruction occurs rarely and happens in 0.1% to 0.9% of the patients. Case Presentation: We report a distal femoral osteomyelitis and sinus formation following arthroscopic ACL reconstruction in a young nonimmunosuppressed patient, which was finally managed with antibiotic therapy and serial debridement. Conclusions: Although infection followed by ACL reconstruction is a rare complication, it can seriously affect the outcome. It seems that we can manage such a case with debridement and intravenous antibiotic therapy. Copyright © 2017, Trauma Monthly. This is an open-access article distributed under the terms of the Creative Commons Attribution-NonCommercial 4.0 International License (http://creativecommons.org/licenses/by-nc/4.0/) which permits copy and redistribute the material just in noncommercial usages, provided the original work is properly cited. Anterior cruciate ligament (ACL) reconstruction is the most common ligament remonstration. However, major complications such as infection dramatically affect the outcome. One of these complications is the postoperative infection that occurs in 0.1% to 0.9% of ACL reconstructions. Infection followed by ACL reconstruction will result in higher hospital costs and a decrease knee function secondary to arthrofibrosis, cartilage damage, or postinfectious meniscal tears (1-3). In the present case report, we described distal femoral osteomyelitis and sinus formation following ACL reconstruction in a young nonimmunosuppressed patient. A 24- year-old male referred to our knee clinic at Ghaem hospital, Mashhad University of Medical Sciences, Mashhad, Iran, complaining from vague pain in his knee, permanent swelling, and intermittent drainage from distal lateral and posterior of his left knee. He had no fever and was otherwise healthy. 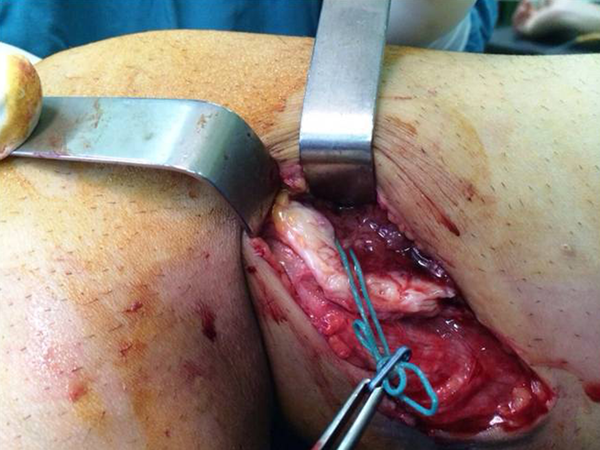 The patient had only isolated rupture of ACL ligament that happened during a sport injury. He had undergone lateral meniscectomy and ACL reconstruction by arthroscopic hamstring autograft and endobottom technique 3 years prior to the current presentation. After reconstruction, he was still complaining of a vague pain more distributed in his left distal femur. The knee range of movement was restricted and the patient experienced pain during knee movement that finally resulted in discharge from posterolateral of the distal femur. At that time, intravenous antibiotic therapy started and resulted in subsides of symptoms and the purulent discharge resolution. However, after 2 months during which the patient was symptom free, he experienced several episodes of lateral femoral erythema and inflammation subsiding autonomously. The results of the physical examination revealed an infectious sinus in the posterolateral of the left distal knee with the infectious discharge (Figure 1). Knee range of motion was restricted to 100 degrees of flexion accompanied with 5 degrees extension lag. The knee was stable except for anterior instability. Laboratory tests at the time of admission were significant for erythrocyte sedimentation rate (ESR) of white blood cell (WBC) count of 7800 (71% neutrophils count), and a negative C-reactive protein (CRP). The patient underwent imaging and anteroposterior; and the lateral radiographs demonstrated a soft tissue swelling near the femoral condoyle and displacement of metallic bottom to lateral proximal side (Figure 2). 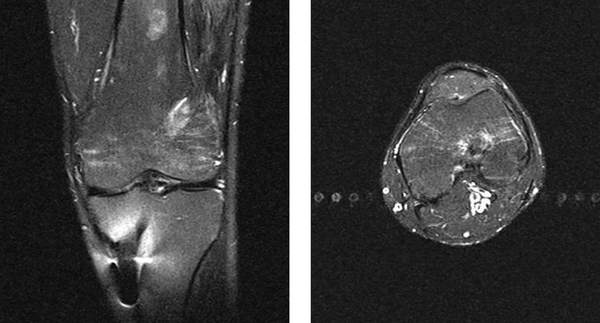 Magnetic resonance imaging at the time of admission demonstrated bone marrow edema around femoral canal and soft tissue swelling at the lateral distal of the femur (Figure 3). The results of the Technetium 99 Bone Scan revealed increased uptake in the late phase through the portion of the left femur, suggesting inflammatory lesion with a large soft tissue component (Figure 4). 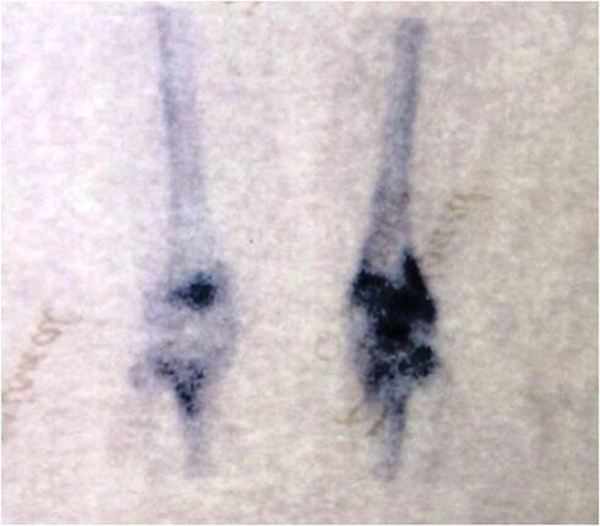 The joint fluid smear and culture obtained at the time of the admission were free of pathologic agents. Figure 2. 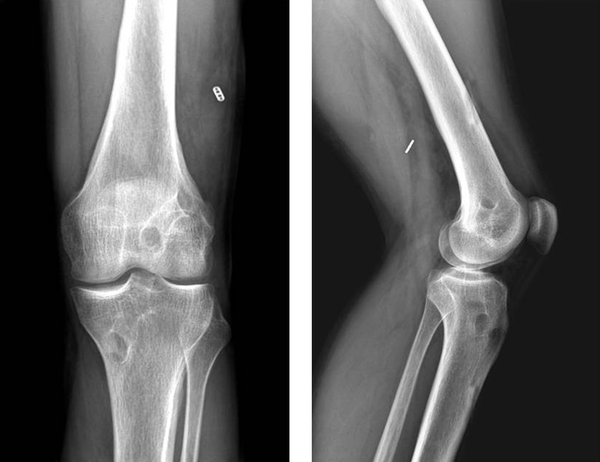 Anteroposterior and Lateral Radiographs of the Patient Demonstrated a soft tissue Swelling Near the Femoral Condoyle and Displacement of Metallic Bottom to Lateral Proximal Side. Based on the aforementioned data, chronic osteomyelitis resulting in infectious sinus was diagnosed. Therefore, the knee underwent arthroscopic drainage and debridement with the portals far from the infectious sinus, followed by an open debridement and sinusectomy at the site of the sinus. The infectious sinus was led to proximal part of the femoral canal and the metallic part of the endobottom was floating in the sinus (Figure 5). The sinus was resected, and then the femoral tunnel was curetted. For microbiologic assessment of the infection, specimens were sent to microbiology lab. A drain was placed, and the wound was closed in the layers. We started the empirical antibiotic therapy just after the surgery. The curettage and debridement were repeated 3 days later. After 2 weeks of intravenous antibiotic therapy with cloxacillin (1 g/q6h), the infection was controlled and the patient was discharged from the hospital. The pathology report was significant for osteomyelitis and cultures were positive for methicillin- sensitive staphylococcus aurous (MSSA). The wound healed 2 weeks after the operation. Oral antibiotic therapy with cloxacillin (500 mg/q6h) was continued for 4 weeks. After 6 months of rehabilitation, the patient was able to return to his previous work with no complaints of pain and he gained full extension and flexion range of motion. After the one- year follow up, the patient only complained of frequent giving way, but he refused undergoing further ACL reconstruction. Septic arthritis and osteomyelitis following ACL reconstruction are rare complications that occur in less than 1% of the patients. Osteomyelitis occurs even less frequently. We found just a few cases of osteomyelitis with bony destruction following ACL reconstruction in the literature (2, 4-11). The interesting point in our case was the formation of an infectious sinus in which the endobottom was floating. Diagnosis of osteomyelitis after ACL reconstruction can be challenging. Early symptoms and signs of osteomyelitis such as swelling, redness, and stiffness may be interpreted as normal reactions to the surgery; thus, delay in diagnosis usually occurs until substantial bone destruction. In our patient, fever, chills, erythema, and drainage were not consistently present. Although in chronic osteomyelitis, the elevation of ESR, CRP, and fibroins are common, in our case, we had lack of elevation of these paraclinical markers, and we had only a neutrophils count shift. Bone marrow edema seen on the MRI is not specific to bone infection and it is usually due to postsurgical changes (11). In the previous case reports, deep vein thrombosis and septic arthritis were the most common misdiagnoses (10, 11). Despite the presence of infection, cultures from synovial fluid may be negative, which may be due to uncommon pathogens (7, 10, 11). Fungal infection after ACL reconstruction has been reported in the literature. The diagnosis of these rare infections has been made based on the histopathologic examinations of bony specimens (7, 11). Therefore, to improve the possibility of accurate diagnosis, we need to obtain biopsy of the specimens as well as culture of the tissues (11). Controlling the infection, preventing cartilage damage, and preserving graft are the main treatment goals (1). It is important to recognize that arthroscopic drainage alone is not sufficient to control the infection (7, 10, 11). It seems that an adequate treatment should include radical curettage and debridement of suspected sites (7). Because osteomyelitis secondary to ACL reconstruction is rare, several questions remain to be addressed. It is not clear whether it is possible to retain the graft or how aggressively we should resect the bone. Although specific criteria for the diagnosis of osteomyelitis after ACL reconstruction was not introduced, any patient with signs of infection should be considered for the diagnosis of chronic osteomyelitis. Moreover, because pathogen is rarely cultured by the conventional microbiological assays, obtaining both culture and bony tissues for pathological evaluation could be helpful.